Hey, Sean, I think I hear someone out in the garage messin' with your stuff! Hurry, go out there and check it out! There's nothing interesting to see here anyway. OK, now that we got rid of him, I'll share my stash enhancement for the week. What's this you ask? 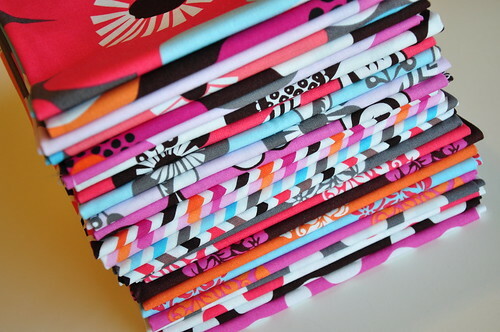 Oh, that huge stack of lovely fabric up there? That's just fat quarters of the entire line of Paula Prass' Woodland Delights collection that I won from Jona at Fabritopia during Sew Mama Sew's Giveaway Week! And those fun patterns? Oh, yea, I WON THOSE FROM JONA TOO! Since she was already shipping a box to Texas, I went ahead and bought some lovely yardage at Fabritopia to go along with those fat quarters to use for binding, backing, etc. I love this happy collection. 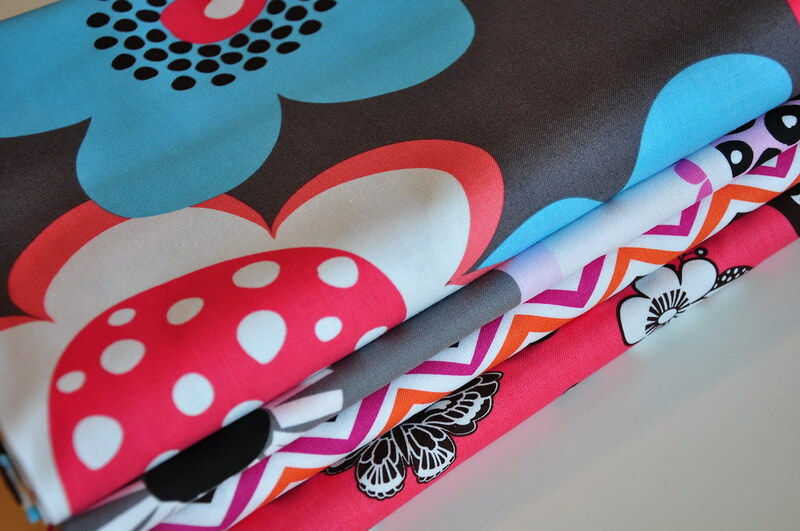 Jona has some great fabrics on sale and has a fantastic selection at Fabritopia. Head over there and check it out and stop by her adorable blog too. She's a sewing maven! Thank you so much, Jona! I won an auction on Ebay and added another HTF (hard to find) FMF (Flea Market Fancy) print to my FMF stash. 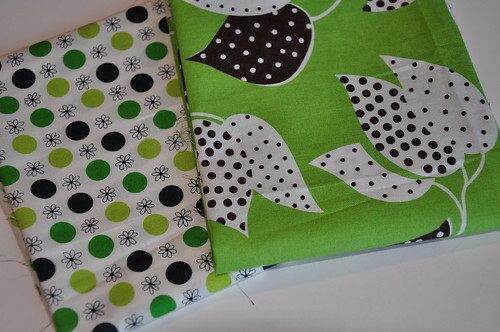 So, if I count the swatches from Jody and Holly, I'm only missing one print, the blue seeds. If you are wondering how I acquired all of these lovlies, I put notes on the flickr photo. 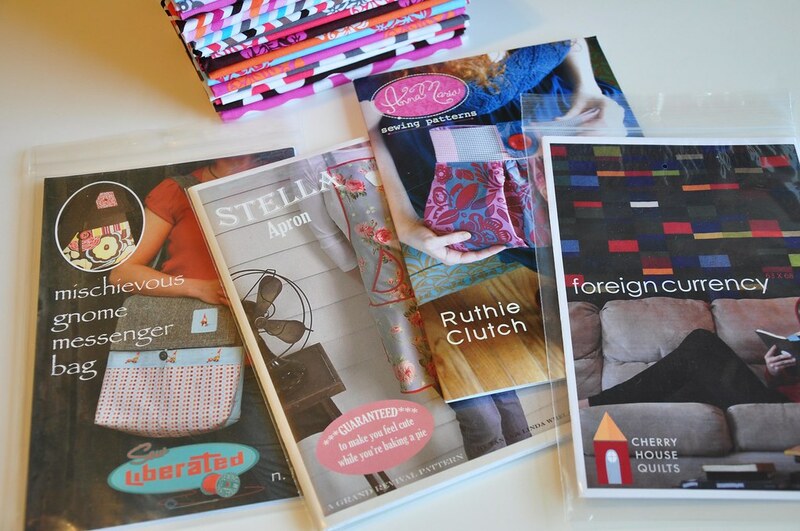 Almost all of the swaps were for that Pez fabric I found at the Dallas Quilt Show. That turned out to be a sweet find! I hope she doesn't mind me sharing this, but the sweet Holly from thimble+bobbin sent me the most wonderful package of 2.5" squares for my hexagon quilt! I received a generous swap from a thoughtful member of the Hexagon Charm Quilt Piece-Along flickr group who included the most adorable needle case with a little embroidered hexie on the front! Geesh, you guys are laying it on heavy. I'm feeling really blessed this week! Sorry for the two post in one day. I was just too excited and couldn't keep all this goodness bottled up! Wowza! Good stuff! And you were a lucky girl! That's awesome! You are one lucky lady!! What a fabulous week in fabric at your house. Lucky you! wow, what an amazing stash of fabric! 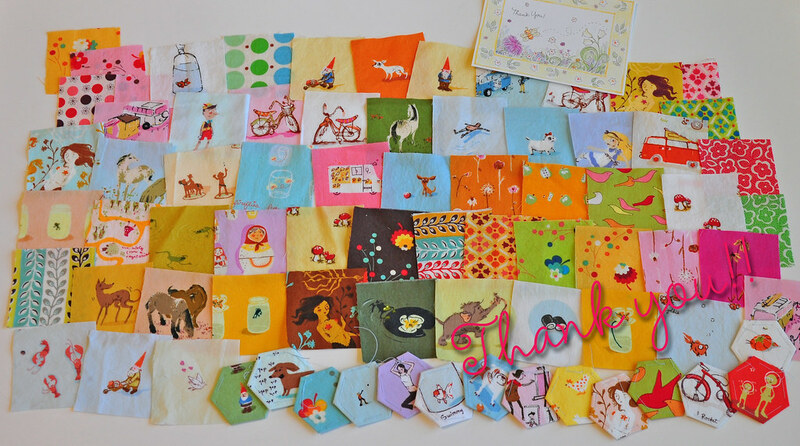 I've been trying to find Heather Ross charm squares on Etsy for my i-spy quilt with no luck, so that package from Holly is making me green with envy! You are going to have an amazing hexagon quilt when you are done. You have a serious obsession going there! 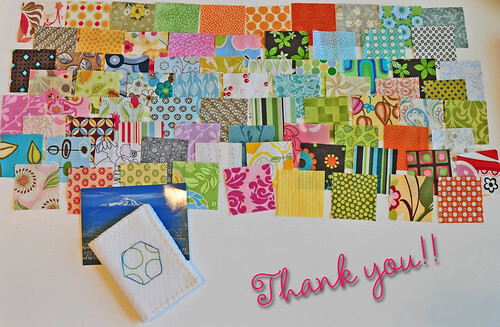 Thanks for all the fabric eye candy! I am "sew" jealous! 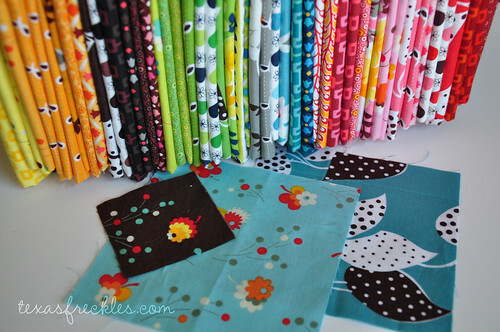 What great fabrics and the quilt possibilites...could be hard to decide what project for the fat quarters. Your hexagon fabrics have been greatly enhanced too! Looks like it was a great week!! Congrats on the win. You have a nice little stash enhancement going on there! score!! lucky girl, have a lot of fun with those goodies! What a fun blog you have! I'm glad I found you!